In this review, we're going to look at the features, technical specifications, negative and positive aspects, and the frequently asked questions about the Excalibur 3948CDB 9 Tray Food Dehydrator. The Excalibur 3948CDB 9 Tray Food Dehydrator comes with a range of features that set it apart from other dehydrators available in the market. It is a robust appliance that will look good on any kitchen shelf and it is constructed from the most durable materials available. The dehydrator is easy to operate and it has a plethora of features that will make dehydrating all kinds of foods a real joy. Here's a look at some of the features of this dehydrator. This dehydrator is a big machine that has a lot of space for all your food drying needs. The 9 large trays that come with the dehydrator each measure 15" x 15" each. You can easily spread out all kinds of fruits, vegetables, and nuts on these trays and get ready to enjoy delicious dried snacks. Excalibur 3948CDB is a powerful machine that dries food quickly and efficiently. The dehydrator is designed to make maximum use of the available space so that it can perform in an optimum manner under all conditions. The 7-inch fan is mounted at the back of the dehydrator so that all trays get an equal amount of air. Unlike bottom or top mounted fans, this dehydrator distributes air in an optimum manner so that all ingredients on the trays get dried at the same time. This also removes the need to rotate trays during the drying operation. The clear door at the face of the dehydrator is perfect for checking up on the food without the need to open the dehydrator. The door is made from a polycarbonate material that is highly durable and easy to clean too. The Excalibur 3948CDB is the ultimate word in efficiency. Whether you want to dry a large batch of fruits and vegetables or you want to dry foods at varying temperatures, you can do it all in this dehydrator. The functions of this dehydrator are simple to understand and it is easy to use too. All you need to do is to place the food items you want to dry on the food trays, choose the temperature and time and switch it on. That's all you need to do! The timer comes handy when you can't be physically present to switch off the dehydrator once it's done drying the food. You can simply set up the timer and the dehydrator will switch off on its own once it's done drying the food. The Excalibur 3948CDB comes with dual temperature control. You can set up the dehydrator to dry at a higher temperature for a certain period of time and then at a lower temperature for the rest of time to get maximum output from the drying cycle. This allows for a great degree of flexibility for drying different kinds of foods. The trays are made from BPA free material so you can rest assured that everything you dry in the dehydrator will be safe from any harmful chemicals. The Excalibur 3948CDB comes with a manufacturer's limited warranty of ten years. In the rare case that anything goes wrong with the dehydrator you can rest assured that you will be able to get it fixed easily. For a device like a dehydrator, it is important to know the technical specifications so that you can be sure the dehydrator is the ideal device for you. This way, when you finally buy the dehydrator you won't get any unwanted surprises regarding its features. Let's have a look at the technical specifications of this dehydrator. The controls of the dehydrator are completely digital and allow for precise setting of temperature and time for every drying session. You can always set up the time and temperature with ease and without any confusion. The dehydrator comes with an adjustable thermostat that allows varying temperatures for drying foods as required by the recipe. Whether you want to dry a food at a lower temperature or a higher temperature, you can do that all very easily. There are certain foods that require a longer time to dry than other foods. 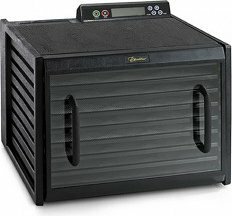 The dehydrator has a 48-hour timer that makes it easy to set it up and forget it. Once the given time is over, the dehydrator will stop automatically. The seven-inch fan is perfect for drying large batches of foods. The large fan distributes air equally over all the trays so that everything gets dried up nicely. You can also set the dehydrator to warm at a higher temperature initially and then lower down to less temperature after a certain time. This dual timer feature is perfect when you want to set up the dehydrator once without the need to change the temperature again and again. The display of the dehydrator is easy to read and you just have to take one look at the screen to know the temperature and the time remaining for the dehydration cycle. The Excalibur 3948CDB is a powerful device that is perfect for drying large amounts of food. The seven-inch fan throws super hot air over the food that's stacked in the trays and it helps in even drying, whether the food is close to the fan or away from it. Excalibur’s patented Parallex™ Horizontal Air Flow and Hyperwave™ Fluctuation Technology ensures the air flow is uniform over all the trays and the super hot air envelops the food to create delicious dried snacks after every drying session. Electronic products often come with certain features or functions that make the device stand out among the competition present in the market. The Excalibur 3948CDB is a powerful dehydrator with a set of amazing features that make it a joy to use this dehydrator. Here are some of the best things about using this dehydrator. The dehydrator is ideal for drying foods in a uniform manner as the fan mounted in the back ensures all trays get an equal amount of hot air. This dehydrator is very easy to use as you just have to add the sliced up fruits and vegetables, choose a time and temperature and press on. That's it. The dehydrator will dry the food as required and alert you once the drying cycle is complete. It is easy to clean the trays and the base unit. The trays are dishwasher safe but you can also wash them with warm water and the base unit just needs a simple wipe from a wet cloth. When you want to dry large amounts of fruits or meats, you can rely on Excalibur 3948CDB. The 9 included trays offer 15”x15” of space per tray. With all this space available, you can easily dehydrate large batches of fruits, meats, nuts, herbs, and vegetables of your choice. Certain food items need high temperature in the beginning of the drying cycle and the Excalibur 3948CDB allows you to choose temperature and timings both. All you need to do is set the temperatures and switch on the dehydrator. It will automatically switch off once the timer is complete. The square shape of the dehydrator is perfect for keeping it on kitchen counters or in a corner. The design of the dehydrator achieves maximum space for drying all kinds of fruits, vegetables, and much more. The dehydrator comes with two free books – Guide to Dehydration and Preserve It Naturally. Both these books are great resources for learning more about dehydrating foods and preserving them for later consumption. For every positive feature of an appliance, there are certain negative aspects that might make it a not-so-appealing device for certain consumers. Here's a look at some of the common criticisms of the Excalibur 9 Tray Dehydrator. If the dehydrator is not placed on an even surface or if the trays are not fitted in properly, it might make noise while it's on and drying foods. While 9 trays are more than enough, any users looking to add more trays will not find this dehydrator up to their requirements. The trays are made from plastic and need to be handled with care otherwise, they might break or bend while washing or cleaning. Tray liners for this dehydrator need to be bought separately as keeping food directly on the tray makes it difficult to clean the trays later. If the fan moves in its housing it might hit the protective grate and make a rattling sound. It is important to avoid manhandling the device while unboxing or placing it on the kitchen counter. The book Guide to Dehydration includes all the information you need to know about dehydrating all kinds of foods. You can find out how to get maximum performance out of your dehydrator by reading this book. This book contains a wide range of recipes for drying all kinds of foods in the dehydrator. You can also learn how to preserve and store your food properly once you have dried it. Q: Do the flavors get mixed up when drying different types of foods in this dehydrator? No there is no risk of food flavors getting mixed up in this dehydrator. Simply keep the fruits and vegetables on separate trays when drying them. Q: How low can I set the temperature on this unit? The lowest temperature on this device is 95°F. Q: Which material are the trays made of? The trays are made of plastic that is easy to clean once you've used it for drying foods. The plastic material is also BPA free that makes it perfect for use while drying foods. Q: How can I prevent the food from over-drying while using this dehydrator? Over drying is not a problem with the Excalibur 9 Tray Food Dehydrator as you can set the time for which the dehydrator should function. Once the time is over, the dehydrator will stop on its own. Q: Does the dehydrator make too much noise while operating? The dehydrator does not make too much noise, it's only as audible as any other appliance like a microwave. When you use it for drying foods, you will not be disturbed by any kind of noise. Q: Can I add more trays to the dehydrator? The dehydrator comes with 9 wide trays that are perfect for regular usage. The dehydrator has no option for adding more trays. Q: What's the purpose of having the fan at the back? Most dehydrators have bottom-mounted fans and that can leave the top layer of foods without any flow of hot air or not enough hot air. The back mounted fan ensures all parts of the trays get an equal amount of hot air and the food gets dried quickly. Q: Are the trays dishwasher safe? How can I clean the base unit? Yes, the trays are dishwasher safe and in case the trays don't fit in the dishwasher, you can wash them with soapy water. The base unit can be cleaned with a wet cloth to wipe away any residue or food particles. If you're in the market for a dehydrator that can prepare large batches of dried food with ease then the Excalibur 3948CDB Food Dehydrator is the ideal device for you. This dehydrator combines modern technology with innovative features that help users get optimum usage from the product. The dehydrator dries all kinds of fruits, vegetables, nuts, and herbs while maintaining the nutrients and taste of the dried foods. The dried fruits and vegetables make for great snacks and you can also preserve them in airtight jars for later consumption. The design of the dehydrator is perfect for modern kitchens and the device is light enough to be carried through the house easily. The dehydrator also comes with a ten years' manufacturer's warranty so in case there is some issue with the device, it can be addressed easily. With all these features and functions, the Excalibur 39484CDB makes a brilliant addition to any modern kitchen.